Red is a color likely to bleed. Not all dyes that bleed stain adjoining fabric. Test to find out, before making the quilt. Photo by Barb Gorges. In my last two columns (see previous blog posts) I listed choices you can make that will prolong a quilt’s life before you even begin sewing. There is one more: the washability test. 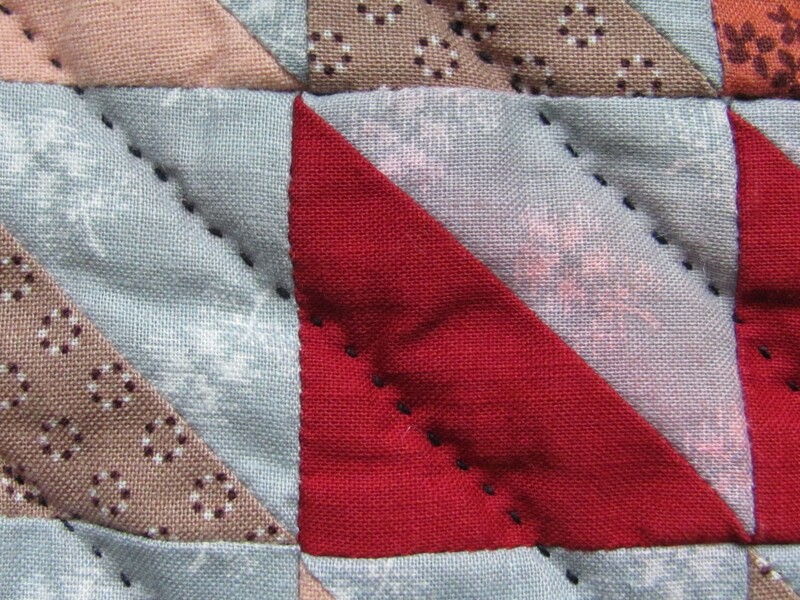 Will fabric dyes bleed and make your quilt unattractive to the next generation? You can throw all of your new yardage in the washer and dryer and that will take care of a lot of excess dye problems. Or, like Harriet Hargrave, test a swatch of fabric in hot water. But even if you see dye bleeding out of the swatch, it doesn’t tell you if it will wash away or re-attach itself to some other fabric in your quilt. Also, if you air-dry your quilt, it might take long enough that rogue dyes have a chance to migrate along seam lines to the other side of the quilt. When preparing to make a major quilt, I make a quiltlet, piecing 2-inch squares of all the fabrics, alternating darks and lights in a checkerboard. I layer that with the batting and backing I intend to use and quilt it. Then I put it in a bowl of boiling water with a little bit of regular laundry soap and let it soak before laying it out on a towel to dry—all the worst case scenarios that might promote bleeding and staining. When dry, I check the light-colored fabrics and along the quilting lines for any discoloration. Testing fabrics this way will also tell you if one is substandard for other reasons, such as excessive shrinkage or fading. If, after washing your quilt the first time, dye has migrated, quickly treat spots with a commercial stain remover and put the quilt back in the wash. You might also want to throw in a few Shout Color Catcher sheets. And after this treatment, you’ll want to dry the quilt quickly.